Hopefully the weather will be cooperating this week and I'll have gotten my garden, as well as some good runs, in by the time you read this. Hopefully the problems with our satellite internet service will be resolved. (Can you say FAPped? Grrr!) Hope your week is going well. Get out and enjoy the beautiful weather! 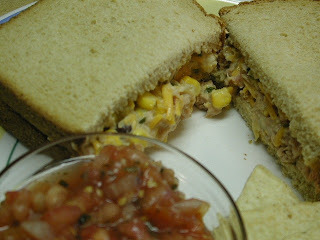 I was in the mood for something different for lunch last week and this Southwest Tuna Salad hit the spot. I had all the ingredients on hand so the salad was quick to put together. Rather than serve it as a salad, I put it on a couple of peices of fiber-rich, whole wheat bread and it made quite a tasty sandwich. In large bowl place lettuce, tuna, beans, corn and ranch dressing. Top with salsa and cheese. Makes one large salad.